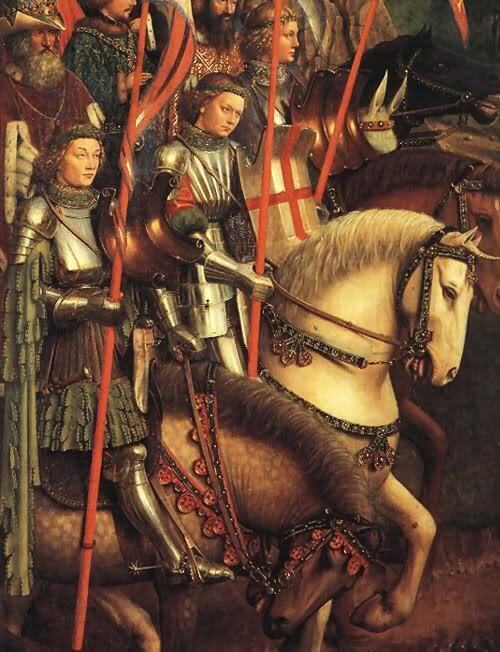 "Armour was valuable, and its appearance a matter of prestige; there are many references to its being cleaned - with pumice and olive oil - and polished to a glorious shine. 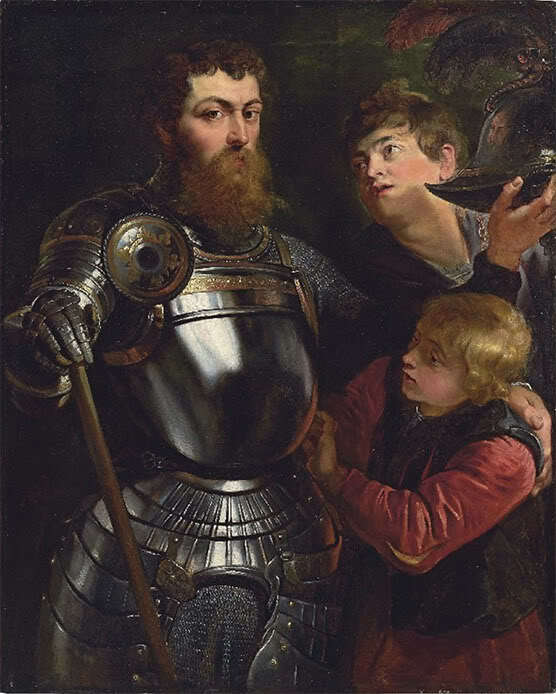 The author has twice been privileged to see the original surface of plate armour, in tiny sections hidden under other parts and so protected for centuries from the ferocious cleaning which has altered the surface of nearly all museum armours; it was exactly like an immensely hard modern steel mirror..."
One of those armours with original surface was discovered in Madonna della Grazie church in Mantua, Italy, where it has been used on a funerary figure, covered in plaster and paint. I have seen in various topics on forums debates about the commonality of "mirror finish", and I have seen several depictions of such finish in contemporary art. I have found several I haven't seen mentioned before, and some were mentioned in a more closed forum, so I decided I'll share them here as well. My intention is not to somehow prove that mirror polished armour is the only correct finish. But I think the abundance of evidence in artwork shows that it was an available finish, and not only for the high end princely suits of armour. 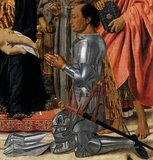 1510 Vittore Carpaccio - Portrait of a Knight - blackened armour, but it still looks polished to high piano gloss! 15th century, Konrad Kyeser: "Bellifortis"
Yeah, he stands out in front of gilded wall, but it's in fact an urban camouflage. It's true--if he were standing against the typical limestone wall you wouldn't see him until it was too late. That's probably how he managed to grab the saint. This is a very good thread! But does anyone know how common mirror-polishing has been among lower class fighters? 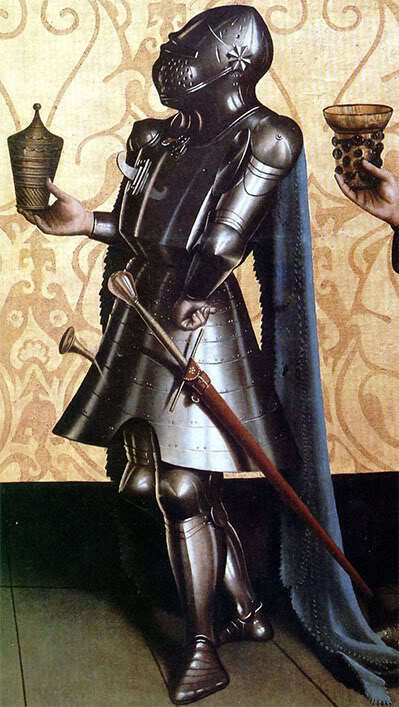 Since I try to portrait a footsoldier from late 15th century - would such a man e.g. have a mirropolished sallet? 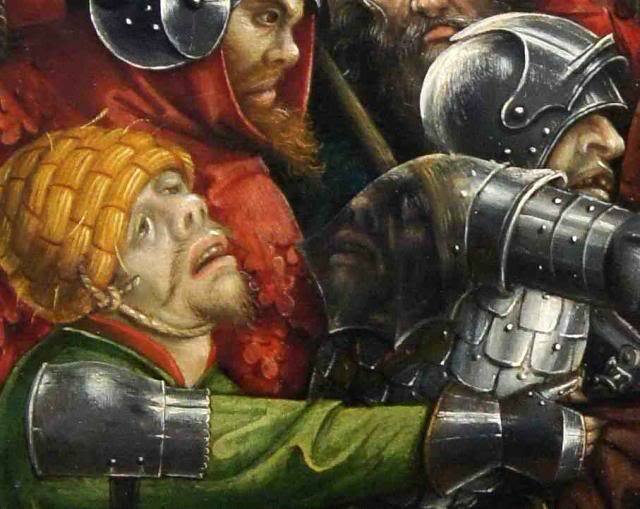 I guess he could own a mirror-polished sallet. Such polishing takes little time in comparison with other processes needed to create a piece of armor. The better the polishing the better the armor resists rusting. However once the armor rusts (and it eventually will happen) such a soldier would probably clean his armor himself in order to save money. Would he have the tools required to achieve mirror polish? Would he have enough time for it? 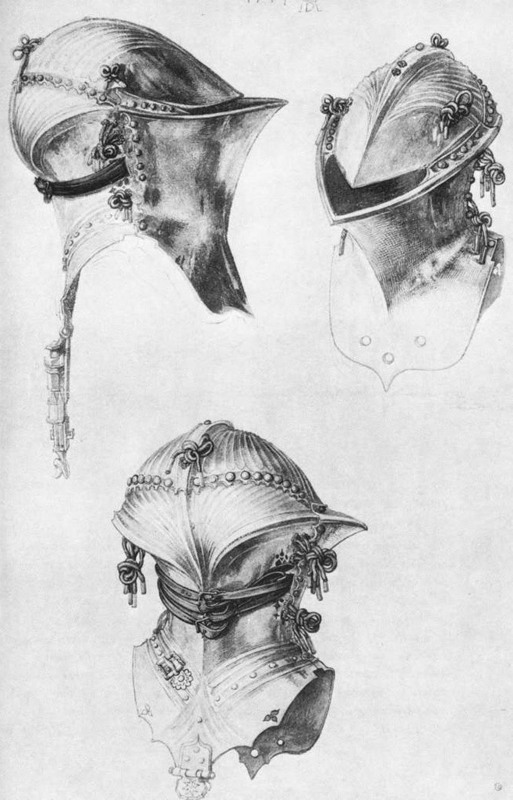 Nevertheless I really would like to have such a mirror polished sallet. It looks great. We are searching for volunteers, it's in the name of science! I'd look at it this way. Human nature has not changed in the past 1000 years. If you look out on the street today, you will see shiny new Porsches that spend a lot of time in the shop getting detailed, the occassional classic car kept in perfect shape by its proud owner, some old rust buckets where the owners have stopped caring, and everythig in between. But most people keep their cars in pretty neat shape, being their second most valuable possession after a home. 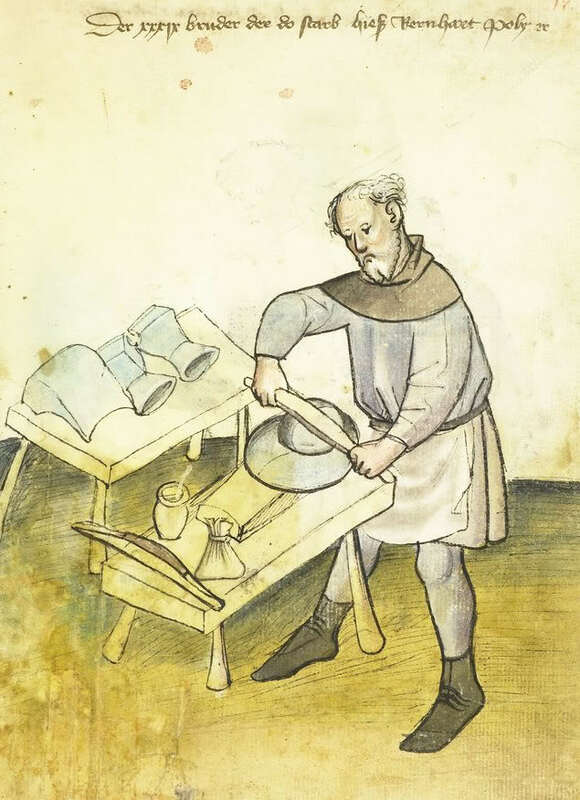 I'd think it would be the same in medieval times - except instead of shiny new Porshes going into the shop, you would have the Nobleman telling his servants to polish his new armor until it shines, and so on, until you get down to the old rust buckets. 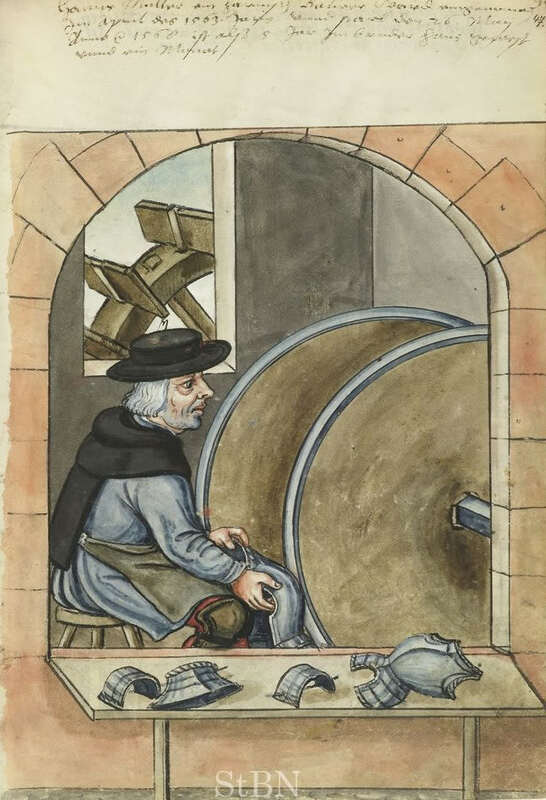 Waterwheels below the workshop power the polishing apparatus. 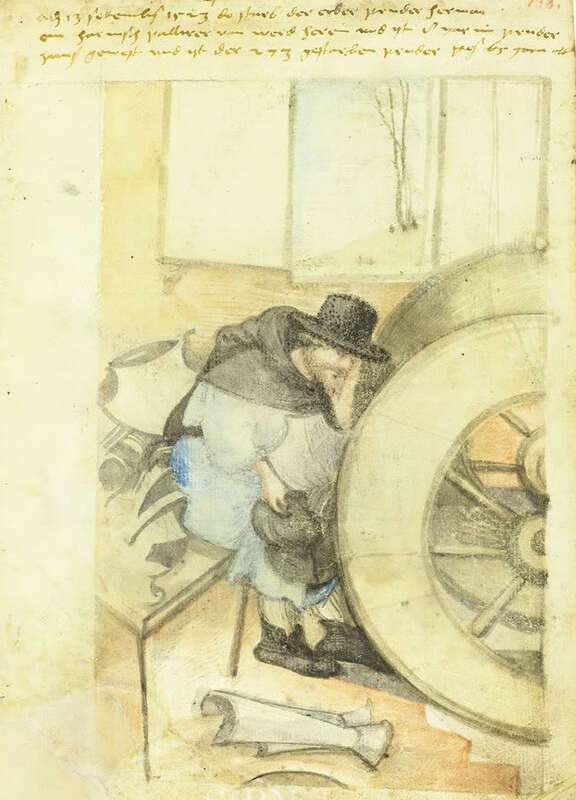 Most of the depictions show "polishing", not grinding, if I understand the photos correctly. 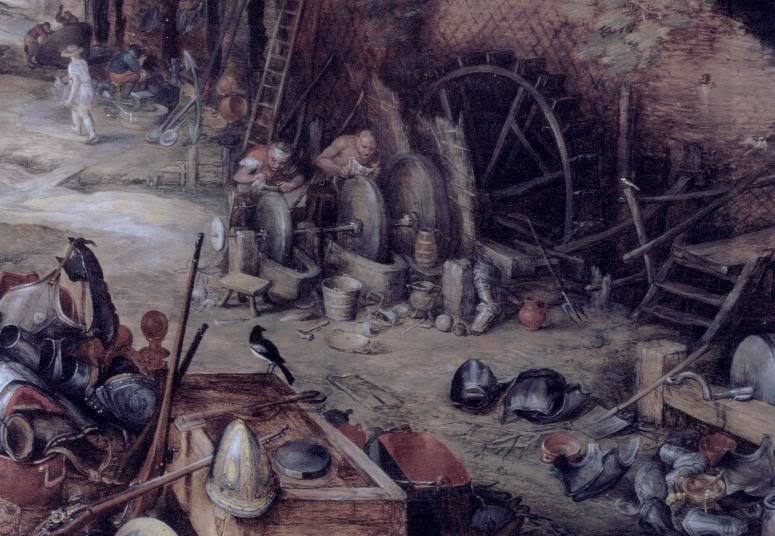 The only depiction of grinding at whetstone seems to be Brueghel's picture from 1670 - Venus at the Forge of Vulcan, large whetstones are half immersed in water basin. 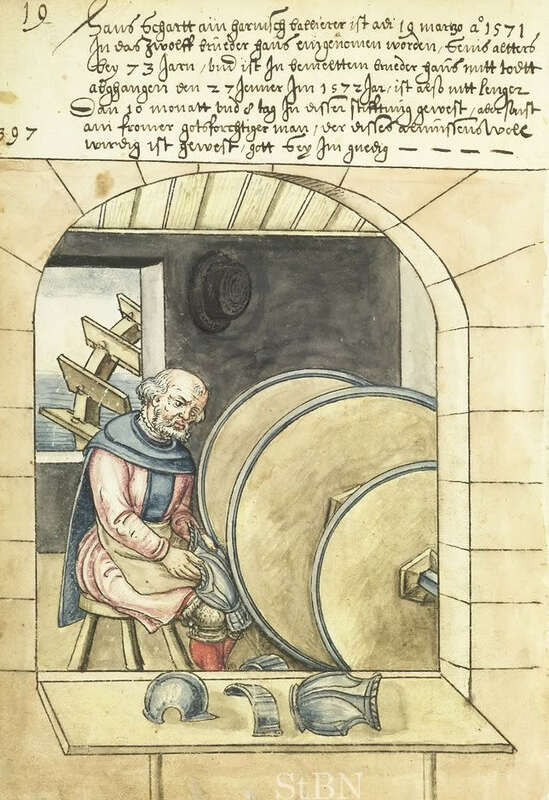 Some of the images show hand polishing with (presumably) wooden handle, covered with leather, while other show polishing at the mill driven wheel, covered with leather or felt. 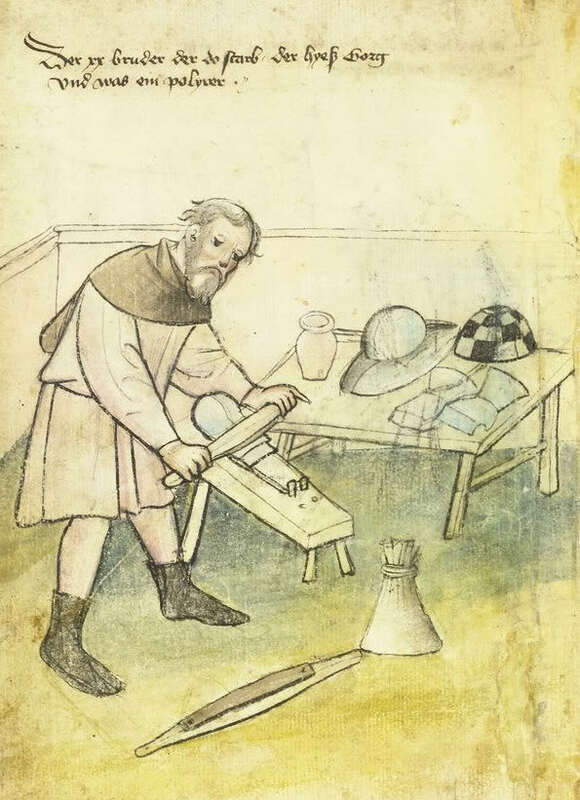 I have read accounts from people doing experimental archaeology about polishing armour with leather covered handle and various abrasive mediums, from fine sand to pumice, wood ash and especially "jeweller's rouge" (Eisenrot, powdered iron oxide, usually hematite). They said that this really is polishing, it isn't useful for rough grinding which is much easier done with files and whetstones. 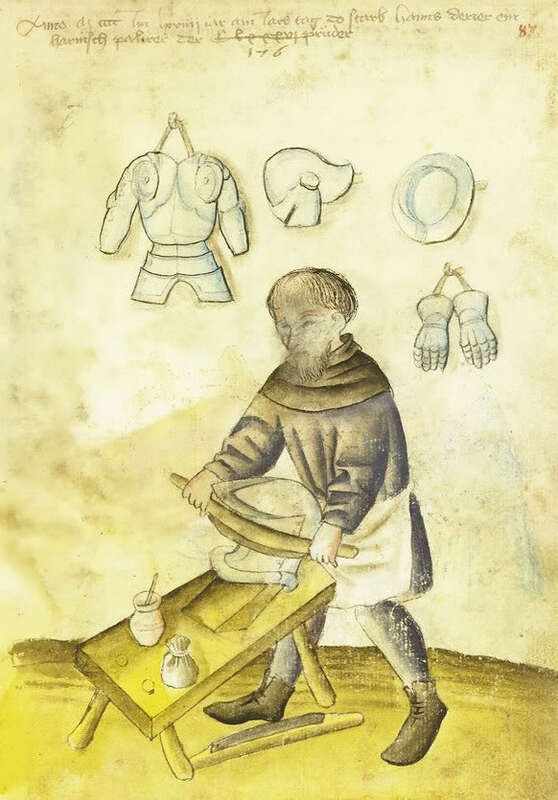 Armour polishers had their own guilds in some towns, and were not always connected to the armourers. 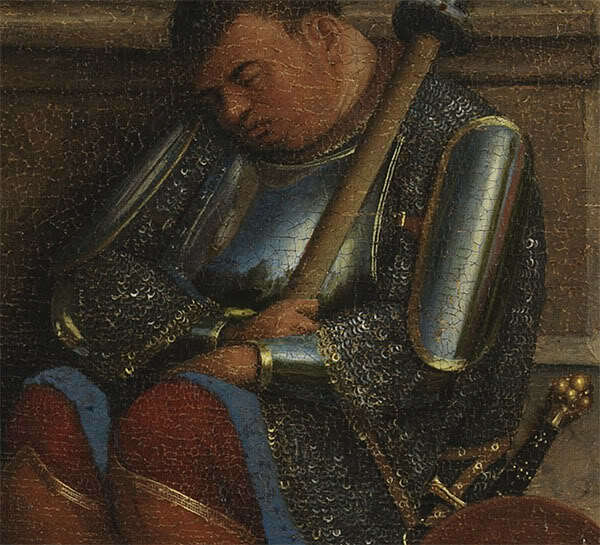 In the above image of the Hanns Muller (1563) you can see that assembled armour pieces are held together by iron rod or wire! 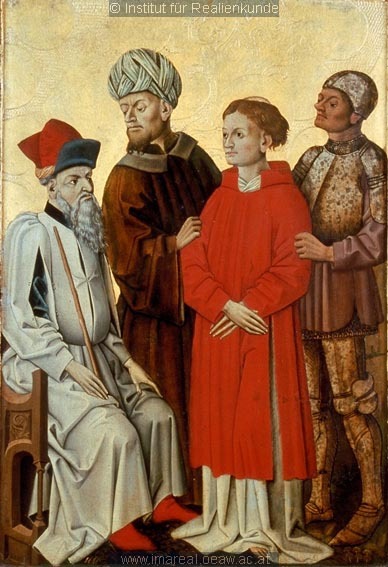 Seeing these depictions it comes clear, that the polisher was a highly specific craftsman. No ordinary soldier would have had the skill nor the tools to do it all by himself. So they had to pay for polishing, if wanted. It's not like polishing your porsche nowadays, it was more like applying a new laquer to the car. Perhaps servants could have maintained an already polished armor... So I assume, that mirror polished parts were more of an upper class thing, or for wealthier mercenaries. My point is that armor was not just armor, just like cars are not just cars - they were/are status symbols that make a statement about the owner. My guess is that as you went up the food chain to the highest nobility, they would be sure to go out in public with armor that shined, especially in ceremonial occasions. Shiny armor would mean that you can afford to buy good armor and afford to take care of it. 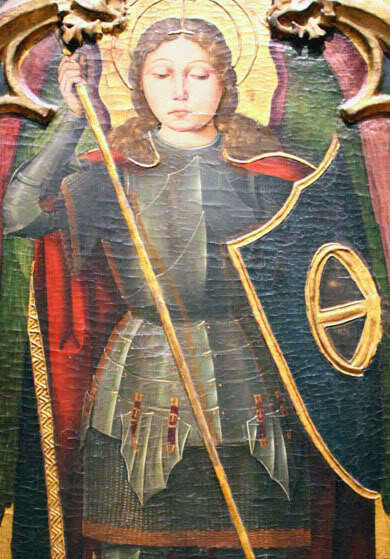 Besides the pictures, there are various proud references to shiny armor and weapons in medieval writings. Makes me wonder why the current fashion amongst collectors is toward a satin finish rather than a mirror finish. So they had quite a bit to do: grinding at various levels of coarseness, polishing at the end to various levels of finish, maybe even final assembly and adding straps in some cases. And they were polishing armour from pretty rough state. End user would receive armour (if new) in pristine condition, and all he had to do was maintain the finish, not grind and polish the armour. 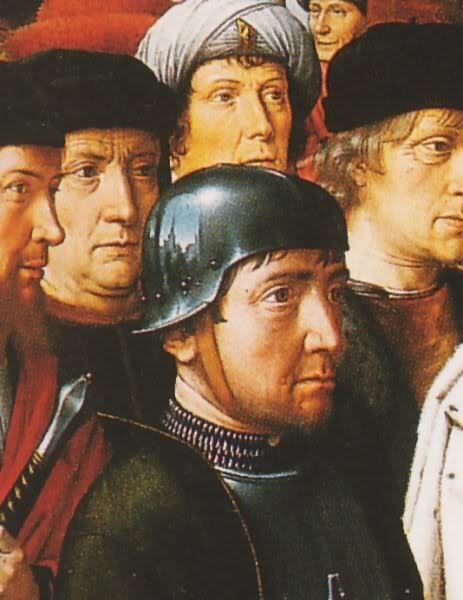 Even on campaign I think soldiers (and I mean poorer soldiers, the ones without squires and pages) would have enough spare time to wipe the armour with the greasy rag or something similar, and even in heavy rain well oiled or greased or waxed armour is quite protected for quite a while. His armour and weapons were his tools of the trade, and being soldier was his profession - it is us with day jobs now that have trouble maintaining armour rust free, since we try to spend as little time as possible on it. I can remember how my army boots shined after 10 - 15 minutes of polishing every evening in the army. There's no way I would do this now in my spare time. 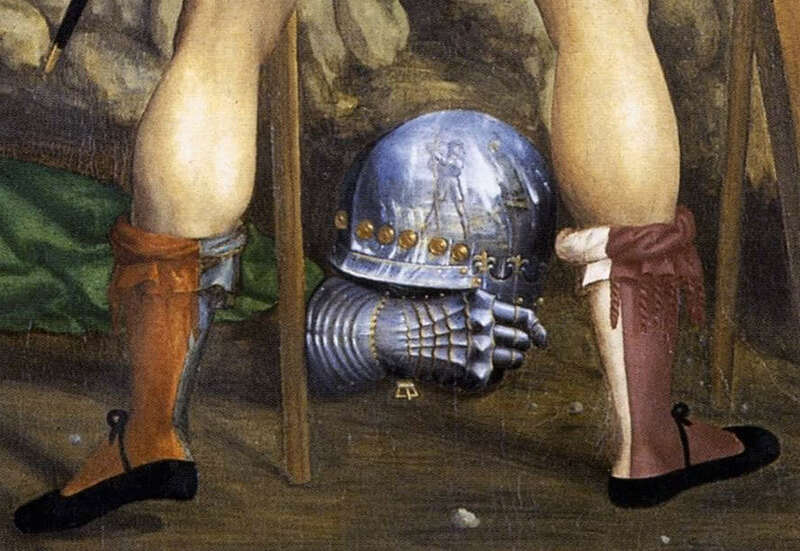 I can imagine armour could be brought to polishers after a while for repolish and strap change. 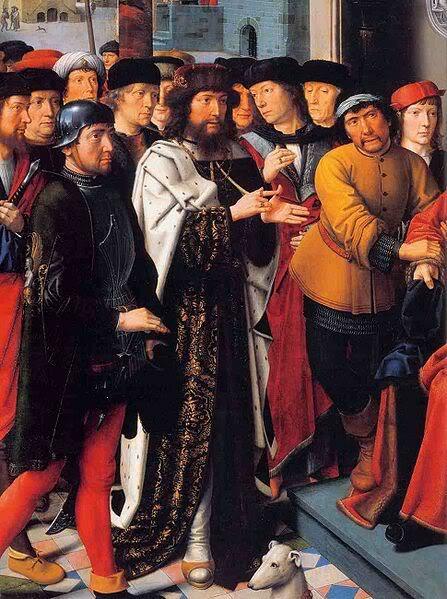 For instance before an important event where the wearer wanted to present himself in best light possible. But I don't think this would be necessary too often if armour was properly maintained. I'd be willing to bet that the same was true of both common soldiers and wealthy knights, at least to some degree. Some took care of their kit, some had others to do it for them, and some just didn't take very good care of it. 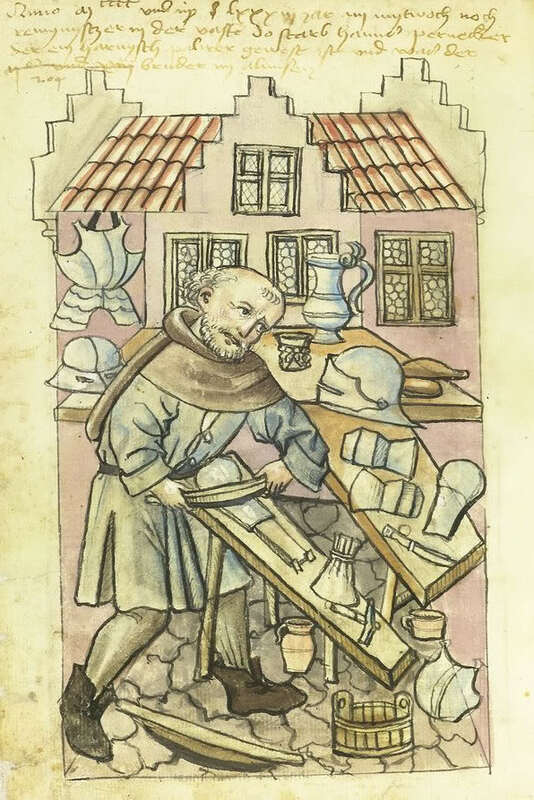 I am more concerned about the tools than about the time. Nowerdays you need a piece of scotch brite (or how this abrazive felt-like stuff is called?) to clean off quite severe rust, but it leaves satin finish. You need at least several grades of sand paper to achieve more or less mirror finish. 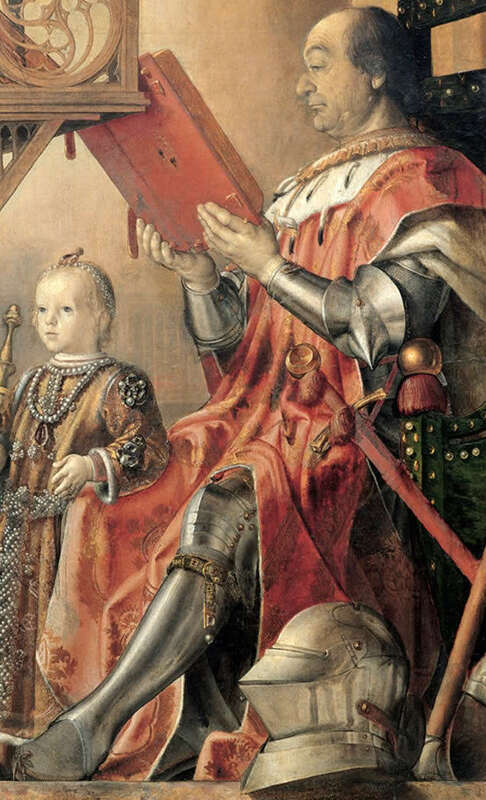 Would a medieval soldier have access to analogue of such sand paper? Another thing. 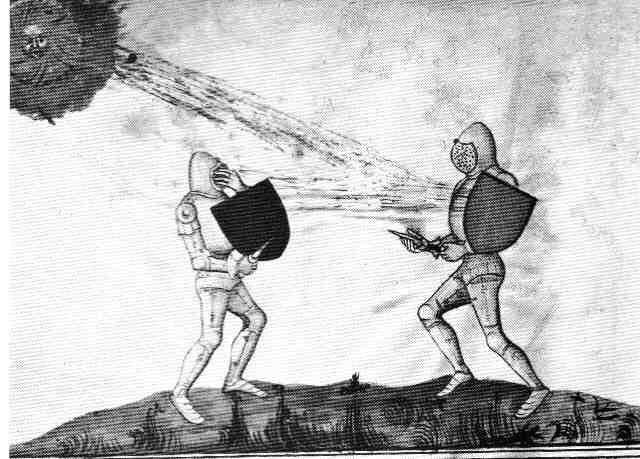 When you fall to the sandy/stoney ground several times your armor inevitably gets scratched (knee protection usually suffers the most). And once the armor is scratched, it requires quite a lot of work (and some removed metal) to remove the scratches. Would an ordinary footmat do it? I doubt. 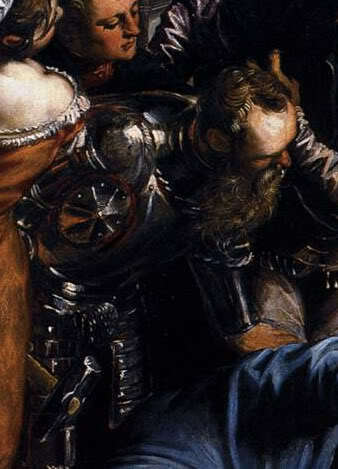 Great online gallery with realy powerful zoom, you can literally see the brush strokes. Click on the links. As far as that experiement mentioned as to how long mirror polish will last in the elements. I am a reenactor who gets to tote a 44 inch long polished boom stick about. Polishing is done with a rag, sweet or boiled linseed oil and some brick dust. Takes only a few minutes to rub the whole barrel down and it will remain bright for a day or two depending on humidity. Indoors it will remain bright for months on end. On the other hand I have gone to sleep in a tent during a rain storm on a warm day with a bright and shiny boom sitck and woken up the next day with red finger prints all over it ready for more polishing... linseed oil seems to work a little better than sweet oil but not much. Best to keep that oily rag on hand in your pouch and any chance you get wipe down any metal parts. 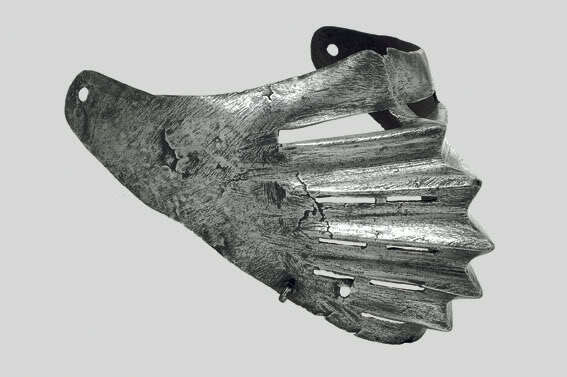 I have a memory of a conversation where it was mentioned that a piece of late 14th early 15th C arm harness was conserved and during the disassembly it was noted that surfaces on parts of the harness not easily visible and likely original where highly polished. Of course this is just a memory of a rumour, but maybe it will spark someone with better information to write.